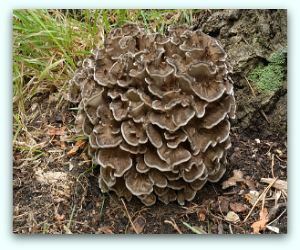 The formal name for hen of the woods is grifola frondosa. It is also known amongst English speakers as Sheep's head and Ram's head. The Japanese name for grifola frondosa is maitake it means dancing mushroom. It is a polypore mushroom which grows at the base of trees in clusters. G. frondosa is indigenous to North America and to northeastern Japan. The underground tubers of the sheep's head have been used in Japanese herbal medicine and traditional Chinese medicine to strengthen the immune system. Additionally it is also used in TCM for treating haemorrhoids, improving spleen and stomach ailments. Maitake is available in tablet, liquid, powdered form as well as dried and frozen. Research has shown that maitake can lower blood sugar; this means it might and may be useful for the control of diabetes. The reason for maitake's blood sugar lowering effects is the mushroom contains an alpha glucosidase inhibitor. The Memorial Sloan-Kettering Cancer Center in 2009 conducted a phase I/II human trial which showed Hen of the woods could stimulate breast cancer patient's immune systems. The maitake additionally contains beta glucan, beta glucan aids the activation of white blood cells. A 1997 study published by the Annals of New York Academy of Science found that an injectible form of extract of maitake enhanced the immune system as well as inhibiting the spread of tumors in mice that had been implanted with breast cancer cells. The same Journal in 1995 reported that that the immune system of mice that had been infected with liver cancer cells also had the same effects when injected with maitake. It prevented the spread of the tumors to the liver as well as protecting the development of any form of cancer in other cells in the body. In a study published by the Academic Press in 1985, maitake was used to treat both allogenic and syngeneic tumors in mice, and both results showed a complete tumor inhibition in the mice. However, this time they were not injected, it was given orally. There are no known side effects associated with this mushroom.